What’s the real difference between high index lenses and other lenses? High index lenses are more efficient at bending light and are therefore thinner than low index lenses. But does that mean that high index lenses are better in every way than low index lenses? Where is the line drawn between the two? High index lenses, in the optical industry, are generally 1.64 index or higher. That said, a 1.60 wouldn’t really be considered a “low index”, though a 1.30 would. Because of this, there is a section of indexes considered “mid index”, which includes 1.50-1.60. Some optical professionals consider mid index to include 1.50-1.70, since high indexes can get so high with today’s technology. Some common “low index” materials are standard plastic and crown glass. Mid index includes polycarbonate and Trivex. High index lenses are considered a lens material category of their own, though they are technically all made of different materials. High index lenses are generally above 1.60 index, and low index lenses are generally below 1.50 index. High index lenses are thinner; a high index lens can be up to 50% thinner than a low index lens with the same prescription. High index lenses are generally more scratch resistant than low index lenses, with the exception of crown glass, which is an extremely scratch resistant low-index material. High index lenses look more attractive than low index lenses, both because they’re thinner and because they reduce eye distortion caused by strong prescriptions. High index lenses are more expensive than low index lenses and generally aren’t worth the investment if you do not have a strong prescription. If you’re a strong prescription wearer, we strongly suggest that you wear high index lenses. If you have a weak prescription, you’re probably fine with low index lenses. 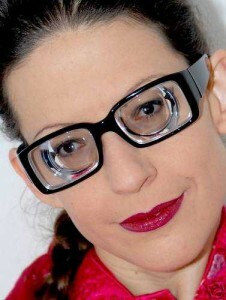 High index lenses are very reflective, which can cause annoying glare for the glasses wearer. If you’re purchasing high index lenses, always get anti-reflective coating to combat this glare. If you are shopping for prescription glasses, it’s good to know what’s best for your prescription. It’s easy to get persuaded by an optical salesperson into getting something expensive that you don’t need. If you have a strong prescription, it’s definitely worth considering getting high index lenses. Your eyewear will look better and be lighter on your nose. However, if you have a light prescription (can see fairly without glasses), then you’re wasting your money with high index lenses. If you have any questions about high index lenses, or the difference between high index vs low index lenses, please don’t hesitate to leave a comment below or browse our other posts. Thanks for reading, and happy shopping!